I have exciting news, my thesis is due on Sunday but I have started the submission process today so I am officially done writing my thesis! It is really a great feeling and I’m so glad it’s done. But of course you’re here for the crafty bits and I also have something quite exciting to share. Slowly but surely I am tackling the end of the LOTR blanket this year, and I have finished another square, Aragorn! 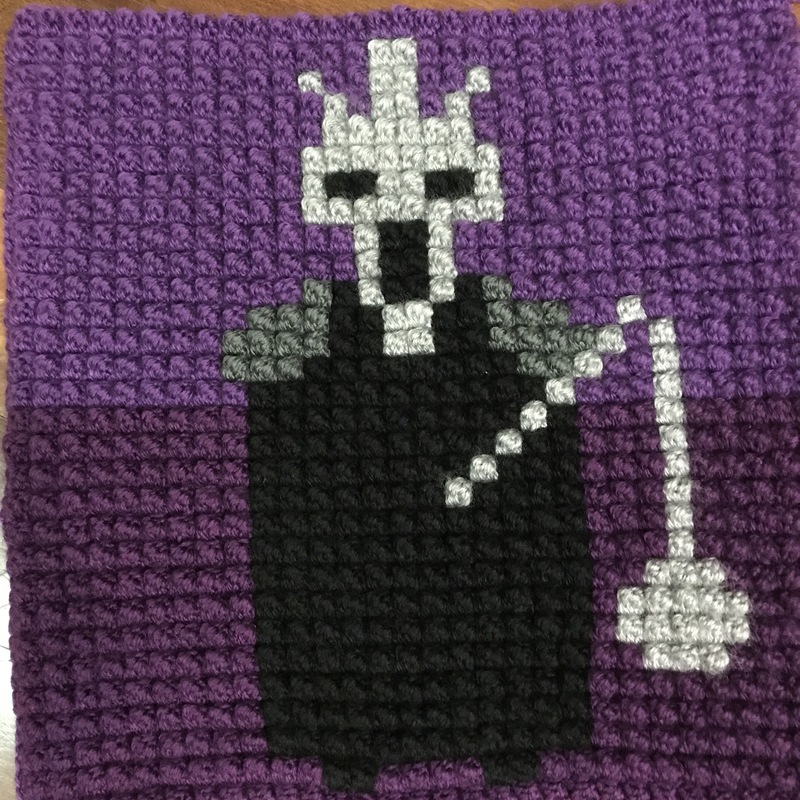 This means I only have 2 more squares to go before I can join my blanket. After over 2 years in the making I’m almost going to be as happy to finish it than I am to finish my thesis! I have had issues staying motivated for such a long project, which is a shame because I love graphs and I would love to make more in the future. Do you have a secret to stay motivated on huge projects? It has been a while but I have finally finished square 9 of my LOTR CAL! I have been seriously distracted by other projects but I hope that I can get back in the groove and finally get done with this huge blanket! I have taken back to my LOTR crochet along now that my ripple blanket is almost done (2 rows left, yay!). I have made a start on Gandalf’s pipe, and here is what it looks like so far. I’ve also been baking today, I made a fresh batch of madeleines using my nana’s recipe and they were delicious! Today was Good Friday, which meant no work and more crochet time! I’ve finished the PDF pattern for Arno the Escargot, and you can find it in my Ravelry shop. I’ve also started a few new projects, which I’ll talk about next week. But what I was most happy about is that I’ve finished another LOTR square! Here comes the Witch King of Angmar, with mace and all! I was really happy to finish this one, I got super frustrated when I started as I knew I wouldn’t have enough yarn for the background, so I went back to spotlight to try to get the same colour and I could not find it at all. So I got another purple and decided to split the background in half. I didn’t know if I would like it but I think it ended up looking quite good! Only 5 more squares to go! I have finished yet another square on my LOTR graphghan CAL. Gandalf the Grey is ready to save Middle Earth. You can find all my LOTR related posts by clicking on the LOTR CAL tab at the top of my blog or by following this link. I still have 6 squares to go, and I’d really like to get finished by May to enter the finished blanket in a craft show! Better get hooking faster! 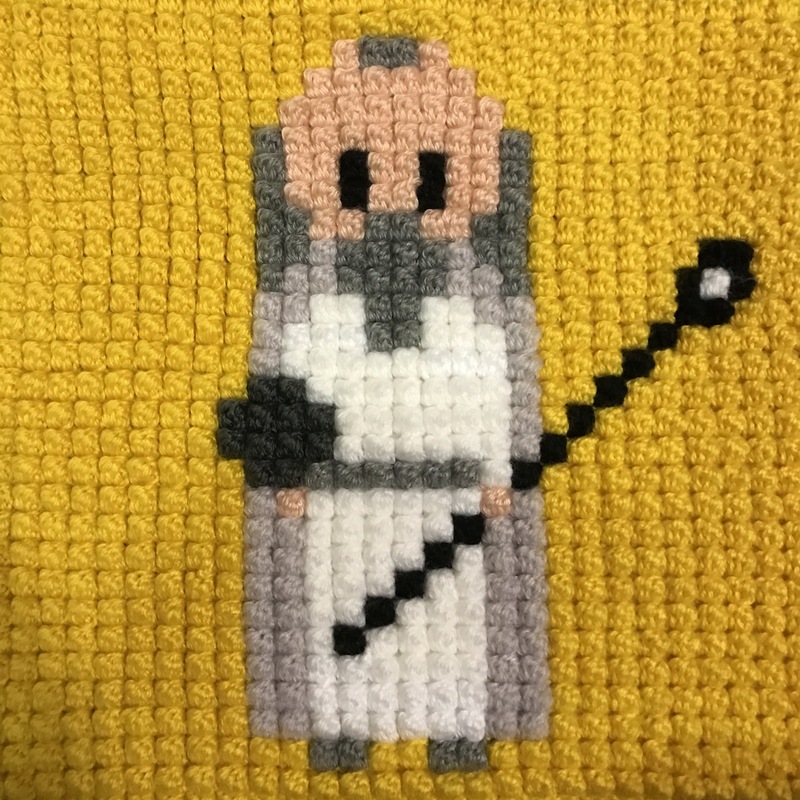 I’ve made some more progress on my lord of the rings afghan, and today I’ve finished Saruman the white, with his staff and palantir. I hope you had a great time last week, the break was very welcome for me. We did heaps of stuff with my brother and his friend and I’ll post some pictures on Wednesday. I also (surprisingly considering how busy we were) managed to get some crafting done! I have finally finished the centre square for the Lord of the Rings graphghan! yay! I’ve made the maths, there are 3,600 bobbles in here, crazy! Hopefully, the rest of the squares will go fast compared to this. I’ve already started Sauron and I really hope to have him done next week. Second last week of our LOTR crochet along! whoop-whoop! This is the last corner square and you have the choice between Arwen’s pendant and the tree of Gondor! As always, you can find the links for week 1, week 2, week 3, week 4, week 5, week 6, week 7, week 8, week 9, week 10 and week 11 by clicking on them. You can find the other graphs for week 1, week 2, week 3, week 4, week 5, week 6, week 7, week 8, week 9 and week 10 by clicking on the links. We have reached week 10 of the LOTR crochet along, which means that there are only 3 weeks left after this one! How exciting! The last 4 weeks will be the heroes of each race, Gimli for the dwarves, Aragorn for the men and Legolas for the elves, as well as the last corner panel. You will have a choice for this one between Arwen’s star and the tree of Gondor. This week though is dedicated to Gimli, son of Gloin. I hope you enjoy the graph, and you can find week 1, week 2, week 3, week 4, week 5, week 6, week 7, week 8 and week 9 by clicking on the links!